Heart of Phoenix was founded in Wayne county, West Virginia by Tinia Creamer, John Creamer, Jessie Hardesty and Sonora Winds. Never let people diminish your care for animal welfare. . .Those who neglect and abuse animals are threats to all mankind. They will do the same to human beings, if they are not already. $12 each - for sale now!!! 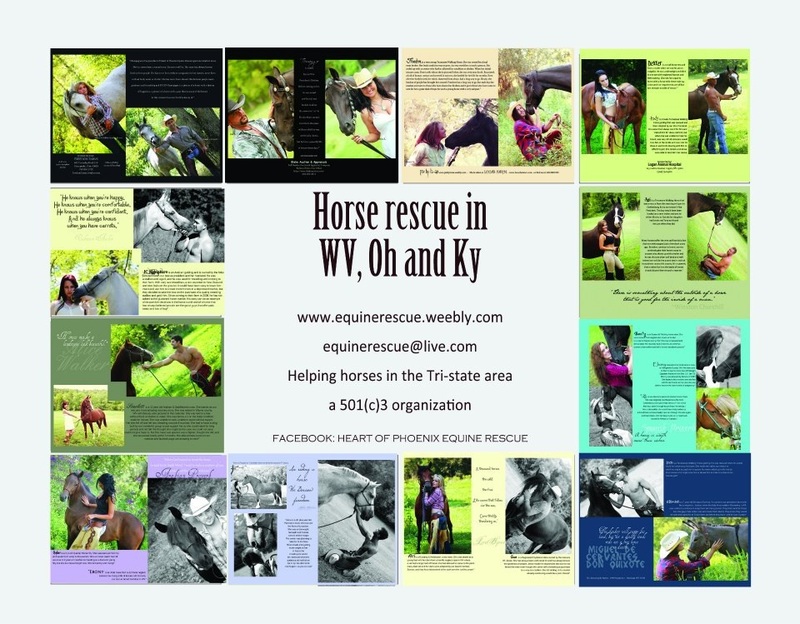 Rescue 2013 and 2014 personal, unique calendars with the stories of our horses! Find our director's personal facebook farm blog "LUCAS FARM" on facebook for the most updated information on what rescues we are doing, hear ways to help horses in need and much more! To set up reoccurring, safe monthly donations of any amount through paypal (they can be stopped at anytime), please click the subscribe link below. Please be willing to work through them with your adopted equine; they do deserve it.